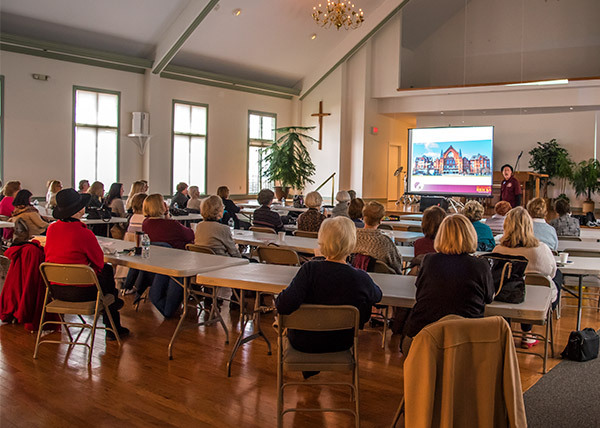 The Society for the Preservation of Music Hall offers Music Hall tours, speakers, and classroom presentations of this world-class historical landmark. Dates available now for Music Hall outdoor walking tours. Enjoy fascinating stories about this amazing structure! 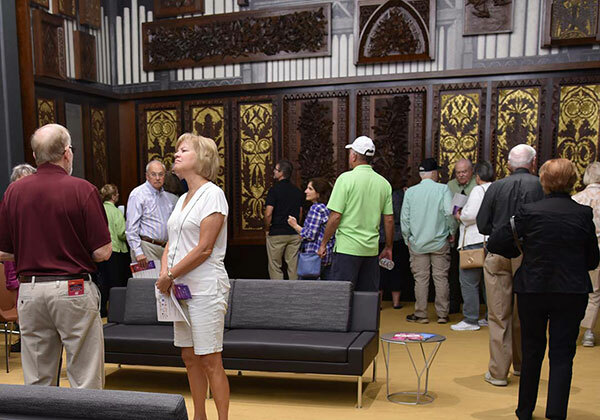 Sign up now for an inside tour of Cincinnati Music Hall. Go backstage and beyond with a tour through private and public spaces in the recently revitalized Music Hall. Explore this stunning and majestic structure. See for yourself how it reflects the spirit of both past and present. Discover why it was the envy of the Great Midwest in the 19th century and the cornerstone of the 21st century renaissance of Cincinnati's historic heart. The SPMH Music Hall tours speak to guests with a wide range of ages and interests! If you have a particular interest in history, music, theater, architecture or Cincinnati culture, this will be a fascinating and memorable experience. Tickets can be purchased up until the time of the tour, depending on availability. It is highly recommended that tickets be purchased in advance. Tickets can be purchased online; at the Music Hall box office, 1241 Elm Street; at the Aronoff Center ticket office, 650 Walnut Street; or by calling (513) 621-2787 [ARTS]. $11 per ticket when you purchase 10-29 or more tickets together. Individuals and groups of up to 29 people should purchase tickets online. 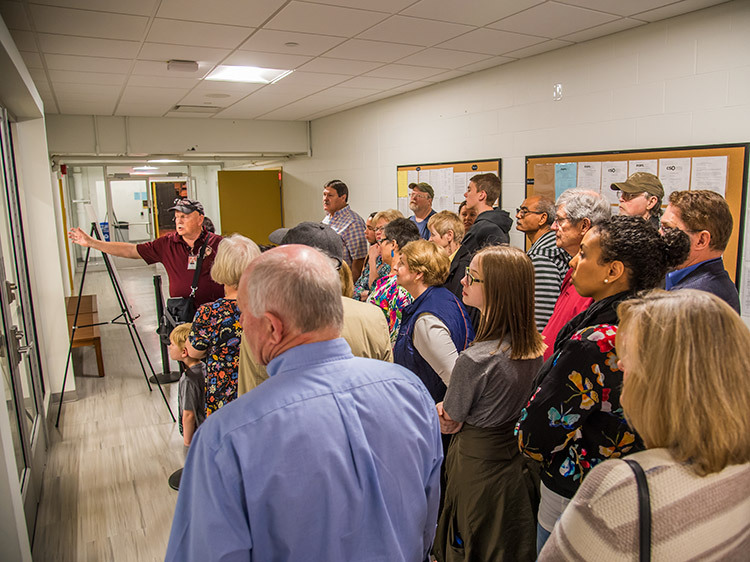 Groups of 30 or more people should book their tour through the SPMH office. Get more information or email musichalltour@spmhcincinnati.org. Special discounts are available for groups over 30 people. $5 each special pricing for student groups. SPMH can help underwrite costs for school groups, based on financial need. 10% discount for members of the Over-the-Rhine Chamber, SPMH, CAA and Certified Tourism Ambassadors. For individuals, and for groups with fewer than 30 people: sign up online for an SPMH tour of Cincinnati Music Hall! Book a group tour (30 or more individuals) through the SPMH office. Get more information or email musichalltour@spmhcincinnati.org. Tour check-in begins 15 minutes prior to start; there is no late entry. Space is limited. All sales are final. Guest cancellation is non-refundable. Food and drink are not permitted on this tour. Tour includes stairs; wear comfortable footwear. Tour is also completely ADA accessible. Children under 18 must be accompanied by a guardian, and these tours are not recommended for small children. For full details, check out the SPMH Tours Frequently Asked Questions page. Go Beyond the Bricks for stories and anecdotes on the structure's history and explores the fabulous architecture, design construction, and the people who helped make it happen. 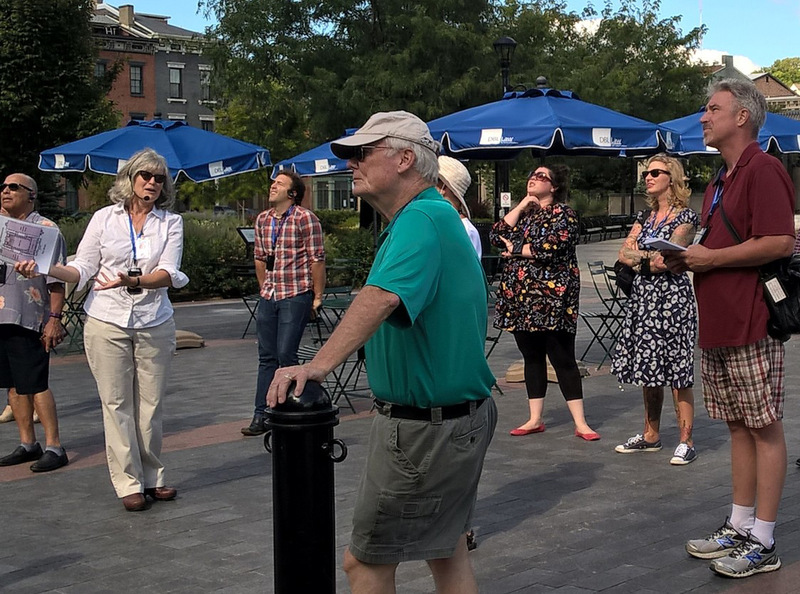 Outdoor Building Tours are held May through October, rain or shine, on a limited number of Thursdays and Saturdays. These are walking tours and are approximately 90 minutes long. Please note: this tour does not go inside Music Hall. 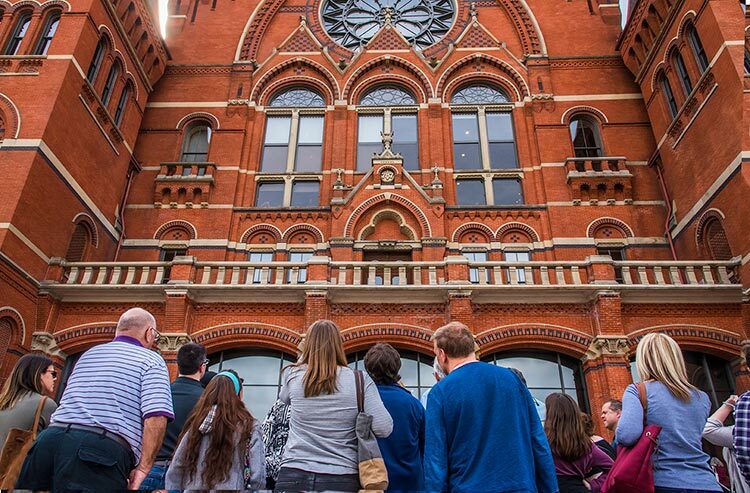 Beyond the Bricks Outdoor Tours of Cincinnati Music Hall occur now through October. For full details, check out the Frequently Asked Questions page. See tour dates and times, or sign up now for an outdoor tour. Evolution of an Icon features historic and present-day images along with stories on Music Hall’s unique role in Cincinnati's history. Music Hall 360 shows an around-the-building view of Music Hall's fabulous architecture while describing the structure’s history and evolution. Music Hall in Pictures: A Virtual Tour brings Music Hall to you! Cincinnati’s Music Hall was built in 1878 as a multipurpose facility for the May Festival and exhibition center for technology, agriculture, and the arts. It has been a national treasure and a community and cultural center for 138 years. Discover the unique history and take a virtual tour of the hall's evolution over the years including highlights from the most recent 143 Million dollar renovation to which SPMH was a top contributor. Come visit beautiful spaces including backstage. Mighty Monument of Sound—The Mighty Wurlitzer Organ will take you retro! Known for creating full symphonic, background music and “sound effects” like train whistles and bird calls, SPMH Program Guides take you back to the time of vaudeville and silent pictures when the Mighty Wurlitzer Organ was all the rage. Follow the rise and fall and rise (again!) of Cincinnati’s own Albee Mighty Wurlitzer Organ and its new life after a 1.4 million dollar renovation in its new home in Cincinnati Music Hall. 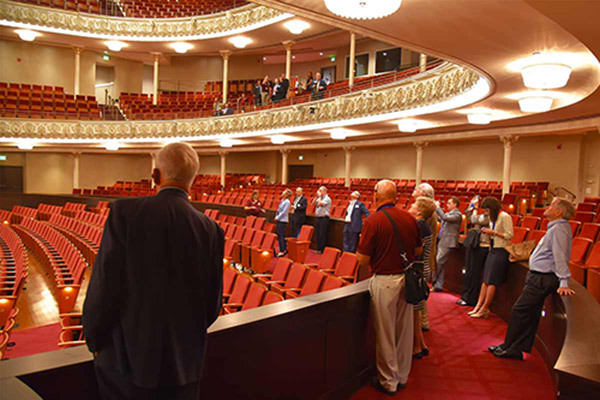 SPMH: Restore and Renew presents historic renovations – particularly the most recent - and highlights SPMH’s mission and role in preserving Music Hall for the future. Pulling Out All the Stops: Music Hall’s Mighty Organs visits 19th century Cincinnati, a center of pipe organ building and Music Hall’s six organs from the Hook & Hastings organ to the famed Mighty Wurlitzer. A one-hour presentation is $150. Special pricing consideration is always extended to school groups. Arrange for a Speaker and presentation/virtual tour of Music Hall through the SPMH office. Get more information or email musichalltour@spmhcincinnati.org. SPMH, in partnership with the Cincinnati Arts Association, is committed to supporting educators and enriching the classroom experience with an opportunity for students to learn the rich history of one of their city’s most significant icons and National Historic Landmarks – Cincinnati Music Hall. Highly-trained SPMH volunteers present a curriculum-based, interdisciplinary, and interactive PowerPoint presentation. 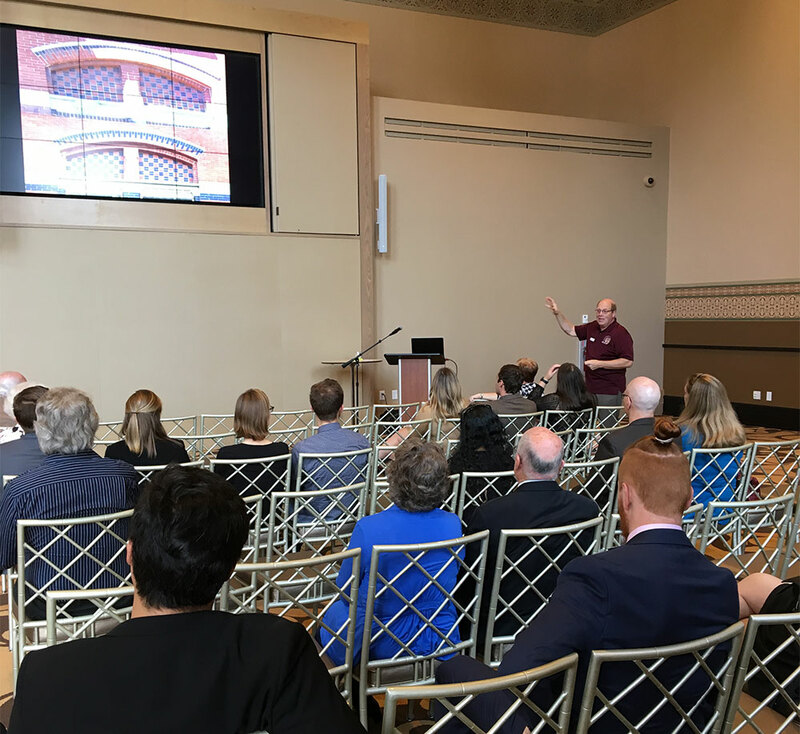 This presentation introduces students to Cincinnati Music Hall, its history, and its connection to the development of Cincinnati and our multi-cultural communities. Students also will be introduced to abstract concepts such as the importance of preservation, volunteering, and philanthropy as it focuses on the social, industrial and cultural environment for why the demand for cultural events developed in our area. Designed with 21st-century skills and curriculum requirements in mind, Beyond the Bricks: Music Hall In-School Curriculum entertains and inspires with customized lessons that relate to multiple subject areas and to life experiences. Find out more about the In-School Program by calling (513) 744-3293, or by emailing musichalltour@spmhcincinnati.org. Program Guide Dale Pepper relates engaging stories during a behind-the-scenes tour of Music Hall. 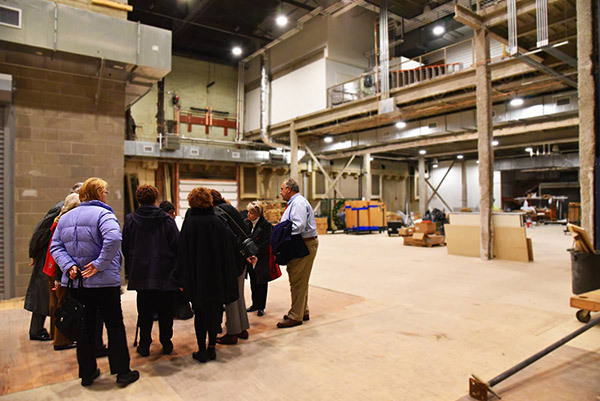 SPMH Program Guide Barbara Gomes shares fascinating stories and architectural details on a walking tour of Music Hall. SPMH Program Guide and Historian Thea Tjepkema describes what workers went through to complete the Music Hall in one year. 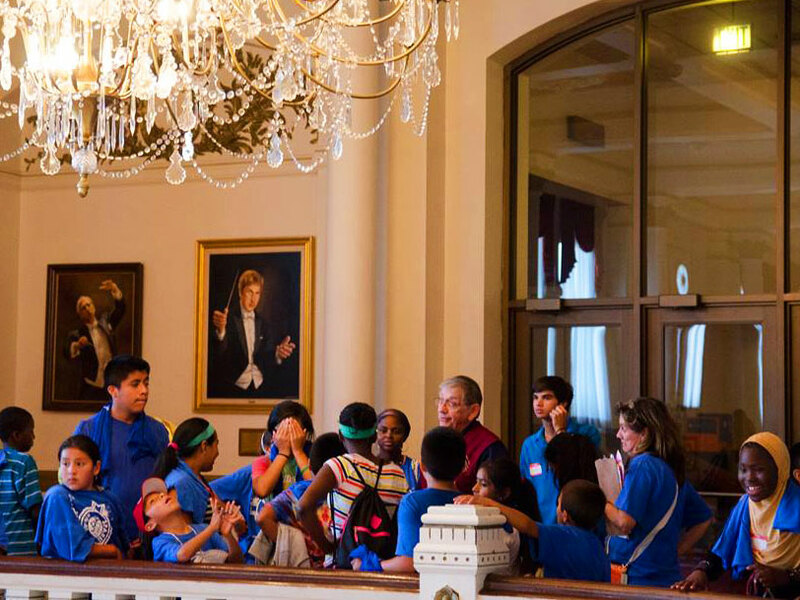 Tour with school children inside Music Hall, before the renovation.